Spike Lee accepts an honorary Oscar at the Governors Awards at the Dolby Ballroom in Los Angeles, Nov. 14, 2015. Cate Blanchett and Laura Linney each paid tribute to Rowlands, calling her a trailblazer and inspiration. The 85-year-old actress, whose career spans six decades, received her Oscar from her son, Nick Cassavettes, who directed his mother in 2004's "The Notebook." He noted that the award was "the first Oscar in the family." 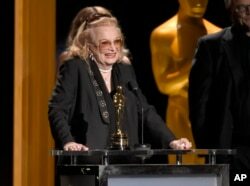 Gena Rowlands accepts an honorary Oscar at the Governors Awards at the Dolby Ballroom in Los Angeles, Nov. 14, 2015. A live band played throughout the evening, and there were two musical interludes: Zooey Deschanel performed the Oscar-nominated song Reynolds sang in 1958's "Tammy and the Bachelor." Aloe Blacc sang "A Change is Gonna Come" as part of Lee's introduction.